Sudoku Anti-King Argyle 9×9 1 puzzleSometimes it’s fun to mix variations together, so here’s a combination of Anti-king and Argyle Sudoku. Anti-king means that no number repeats a “king’s move away in chess”. In practice this means that no two identical numbers touch in any direction, including diagonally. Argyle means that no number repeats on any marked diagonal. The diagonals form an ‘Argyle’ Scots tartan pattern. 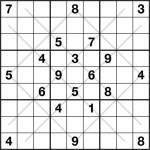 And since it’s a Sudoku, you must also place 1 to 9 in each row, column and bold-lined 3×3 box. Sudoku Diagonal 9×9 1 puzzleI’m working on lots of different Sudoku variants for my forthcoming book, so I thought I’d post some of them here. 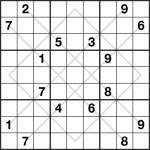 On that basis, here’s an Argyle Sudoku puzzle. Just follow the usual rules but also note that you can’t repeat a digit in any of the marked diagonals.